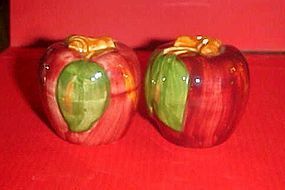 Nice hand painted salt and pepper shakers are made of glazed ceramic. Dark rich coloring Newer shakers, measure over 2" tall...no corks These would match perfectly with the Apple Franciscan dishes. Adorable vintage salt and peper shaker set. 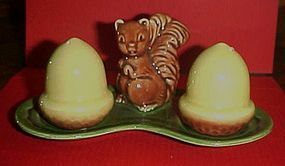 Little squirrel on the caddy holds two acorn shakers that still have their original corks. All decoration under glaze each acorn is 2 1/4" tall. Stand is 6 1/4" long. Perfect condition with no chips cracks or damages. 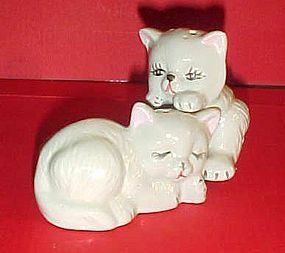 Adorable porcelain salt and pepper shakers are white persian kitty cats. Tallest kitty measures 3" tall. Perfect condition with original stoppers. These are adorable!! 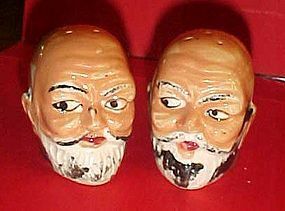 Ol hand painted ceramic shakers of a bald man. well he does have facial hair and a little on the backk of his head, lol. Made in Japan and measure 2 1/8" tall. Perfect condition with no damages, but no corks. Black JAPAN ink mark. All hand painted decoration under glaze. Vintage collectible mini "go with" salt and pepper shakers. The little Birthday cake goes with the birthday present. No stoppers as they never came with them and were sold of as a novelty, and not so much for use. If you did use them, you were just expected to put tape over the bottom holes. Wonderful condition with no damages. All hand painted. I have seen these listed as by Arcadia, and some argue they are not. Nice vintage silver plate teaspoon by Community, a division of Oneida & is about 6 1/4" long. I have 5 and they each have the monogram W, with gentle wear for an item this age. No heel wear. Adam Designer: Grosvenor N. Allen. I have other pieces to this pattern listed. Some without Monograms. Vintage silver plate master butter knife spreader in the Encore pattern from 1934, Measures 7 1/2 " long. Very nice condition for the age. Add to your flatware today. Vinage silver plate teaspoon in the Encore pattern from 1934, Measures 6 " long. Very nice condition for the age. I have 9 available. Debutante aka Grandeur aka Princess Royal flatware pattern was first introduced in 1934 These grille knives measure 8 3/8" long and are marked "Wm.A.Rogers stainless" on blade They are in good condition, showing normal signs of use,No dents, no worn spots, no plate loss, and no monogram. I have 2 available, I will be listing othr pieces in this pattern. Silver plate teaspoon in the Flirtation pattern by 1881 Rogers/Oneida. Measures 6" long. Great vintage condition with normal wear. Add to your vintage flatware today. I will list other pieces to this pattern. I combine shipping and you pay only what the post office charges, nothing more. Silver plate soup spoon (I think) in the Flirtation pattern by 1881 Rogers/Oneida. Measures 6 3/4" long. Great vintage condition with normal wear, without any wear to the silver. Add to your vintage flatware today. I will list other pieces to this pattern. I combine shipping and you pay only what the post office charges, nothing more. Silver plate hollow handle dinner knife with stainless blade in the Flirtation pattern by 1881 Rogers/Oneida. Measures 9" long. Great vintage condition with normal wear, without any wear to the silver.Add to your vintage flatware today. 4 knives available. I will list other pieces to this pattern. I combine shipping and you pay only what the post office charges, nothing more. Vintage 1847 Rogers Bros. Berkshire Silver plate Oval Soup Spoon 1897. Measures 7 1/4" long. Average normal wear for flatware of this age, and polishes up nicely. Some have light heel wear. I have 11 available. Vintage 1959 Flirtation pattern silver plate dinner fork. and polishes up nicely. Nice average condition with no wear to the plating. Measures 7 1/4" long. I have other pieces in this flatware pattern I will be listing. I combine shipping to save you money and charge actual shipping only. Vintage Princess pattern silver plate master butter knife / spreader by Lady Doris. Designed in 1929 by Ernest T. Beck. Nice average condition with no plate wear. Measures 6 3/4" long. A very pretty pattern. Add or replace missing pieces to your flatware set. We combine shipping and have other pieces in this pattern. Vintage Princess pattern silver plate oval sopup spoon by Lady Doris. Designed in 1929 by Ernest T. Beck. Nice average condition with no plate wear. Measures 7 3/8" long. A very pretty pattern. Add or replace missing pieces to your flatware set. We combine shipping and have other pieces in this pattern.